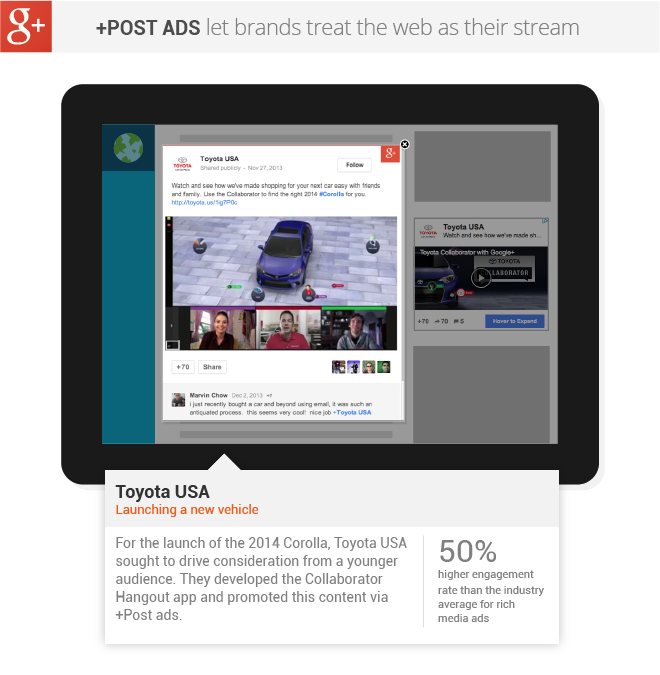 Google just announced they’re finally rolling out +Post ads on Google+ pages within the Google Display ad network. +Post Ads are simply promoted posts: links, photos, videos, and Hangouts on Air that are pushed into the Google Display Network where they appear as native interactive content. And by interactive, they mean totally interactive. Users who are logged into G+ (which most are these days thanks to a smart Gmail integration) can comment, share and +1 without leaving the site they saw the ad on. Brands using the +Post Ads product can also choose to automatically promote their most recent Google+ post, paying only when people engage with the content. For now, only Google+ Pages with 1,000+ followers can create +Post ads, promote Hangouts on Air and automatic posts. Announced in late 2013, Toyota USA and ASOS were some of the first brands to test out the product. Toyota’s 2014 Corolla campaign saw a 50% higher engagement rate than the industry average for rich media ads and and 71% of live viewers for ASOS “Shoppable Hangout” watched through a +Post ad according to Google Case Studies listed. For brands this opens up a much wider advertising network for social content; brands can target and promote their +Post ads through the AdWords system. This should provide more consistency for marketers and ideally better content optimization across multiple paid media channels while staying interactive and rooted in social. As Facebook also announced a change in their right hand display ads to provide a more consistent experience, and as Tumblr, Pinterest and Instagram evolve their advertising offerings, don’t lose sight of creating engaging content. Use social relationship platforms like Expion and others to help analyze and share insights about that content across your organization. By developing content that appeals to your audience inside of social channels, brands can now work to deliver the right message at the right time to potential consumers outside of social channels through new forms of paid media.